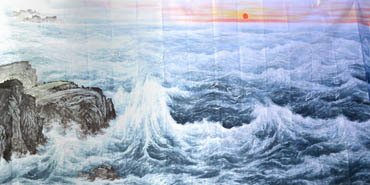 Chinese Sea / Seascape Painting, one type of Chinese landscape painting, that is mainly expressed by sea wave to make a show of the sea's power and charm. 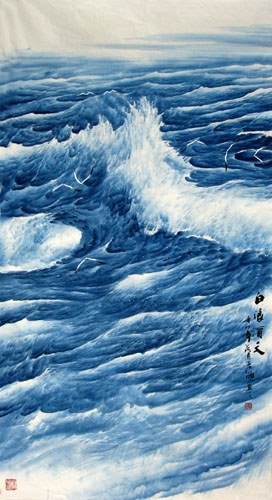 Sea wave shows the broad, bold and magnificent character of the sea, bringing people sharp visual impact. Painter also unfold the calm side of the sea: smooth sea with warm sun; or full moon rises over the sea; or quite harbour with fruitful fishing boats, ect. The sea is vast and changeable, full of mystery as well as hope. In the underdeveloped ancient times, the sea is often associated with immortals because immortals represent mystery and hope. 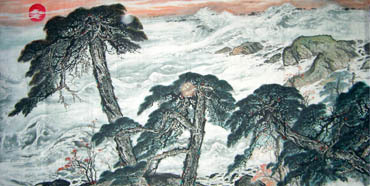 Nowadays, painter create seascape with Chinese ink and colors to express the different theme. 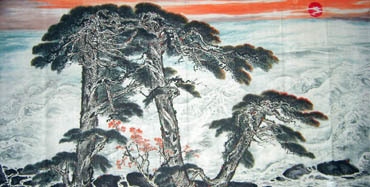 They pay more attention to express their own feeling of natural world and life through painting. Appreciator could feel the infinite energy and great momentum of the sea from those Chinese seascape, whilst appreciate the pleasure of being there.